Members of the Russian Communist party have called for the new Indiana Jones film to be banned in the country because they say it distorts history. 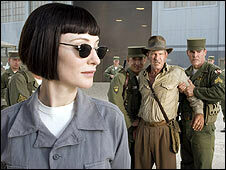 Indiana Jones and the Kingdom of the Crystal Skull, set during the Cold War, sees Harrison Ford's character battle Cate Blanchett's evil KGB agent. St Petersburg Communist Party chief Sergei Malinkovich told the Reuters news agency it was "rubbish". "Why should we agree to that sort of lie and let the West trick our youth?" He said many Russian cinemagoers were teenagers who would be "completely unaware of what happened in 1957", when the film is set. "They will go to the cinema and will be sure that in 1957 we made trouble for the United States and almost started a nuclear war. "It's rubbish... In 1957 the communists did not run with crystal skulls throughout the US." The Associated Press news agency quoted Moscow Communist official Andrei Andreyev as saying: "It is very disturbing if talented directors want to provoke a new Cold War."